1盎司2015珀斯铸币厂羊年狮密印银币 With strictly limited mintage, this coin combines the Perth Mint's popular Lunar series with a privy mark of a Bavarian Lion. 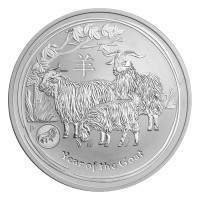 For 2015, the Perth Mint's internationally renowned Australian Lunar Silver Coin Series II celebrated the Year of the Goat, the eighth animal in the 12-year cycle of the Chinese zodiac. These superb quality releases are perfect for people born in "goat" years - 1943, 1955, 1967, 1979, 1991, 2003 and in 2015 - who are regarded as mild mannered, pessimistic, shy and sympathetic. Personality traits like creativity, dependability, calmness and intelligence help to make them very charming to be with. The reverse of each coin depicts three goats in a field, one grazing. There is foliage in the background and foreground and tufts of grass to lend a pastoral atmosphere to the scene. The Chinese character for "goat" and the inscription "Year of the Goat" also appear in the design along with The Perth Mint's traditional "P" mintmark, the year and weight. As well as appealing to silver coin collectors, these outstanding releases also make great gifts for people born in any year "ruled" by the Chinese lunar goat.